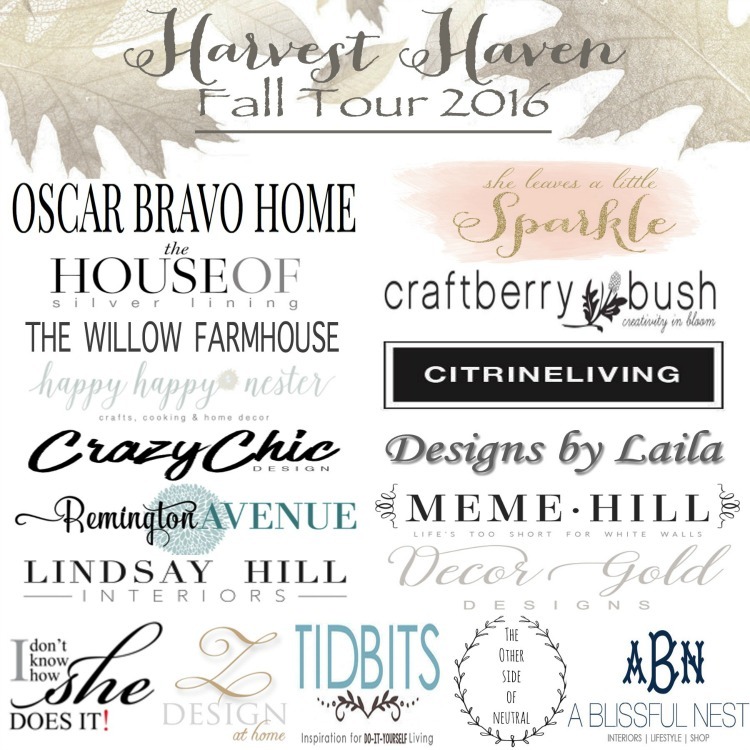 Hello & welcome to the Harvest Haven Fall Tour 2016! I really can’t believe how fast this year has flown by! Seems like only a couple of months ago we still had snow on the ground…well, that is true living in Colorado. Summertime came and went in a flash but I’m welcoming the fall season with wide open arms. 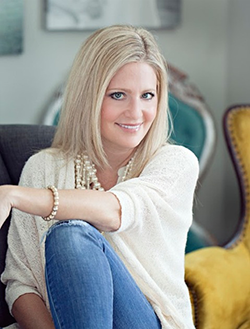 This is going to be a fun tour with a fabulous group of bloggers organized by our adorable host, Summer at She Leaves A Little Sparkle. Isn’t that such a cute blog name? Love her. For those of you coming from the talented & creative Amie, at MeMe Hill, welcome to our home in Colorado! I love having visitors! This is the first year I’ve actually decorated my house for fall before getting all the Halloween decor out. Shocking for me! We have an annual Halloween bash every October and I LOVE getting the house ready for that. Since this tour is more about fall harvest, I’m sparing you the skeletons lounging on the sofa and the creepy spiders on the books. You’ll have to come back in October to see what I do for halloween decorating (please do!). When I started to think about this tour and a few other fall tours I’m participating in over the month, I went on the hunt for some “fresh from the farm” pumpkins. Can someone tell me where have all the pumpkins gone? I should say why aren’t those pumpkins harvested yet? Don’t the farmers know that bloggers decorate their homes in July for fall tours?? That may be a slight exaggeration, we wait till August 1. 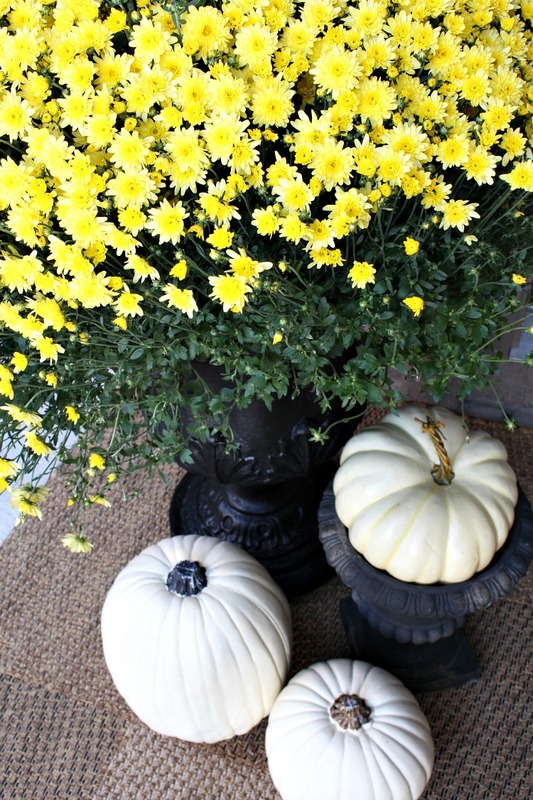 I probably could have gone to a pumpkin farm to find some pumpkins for our front patio, but that is a tradition we’ve been doing with our boys every year and we haven’t had any free time on the weekends yet to do that. 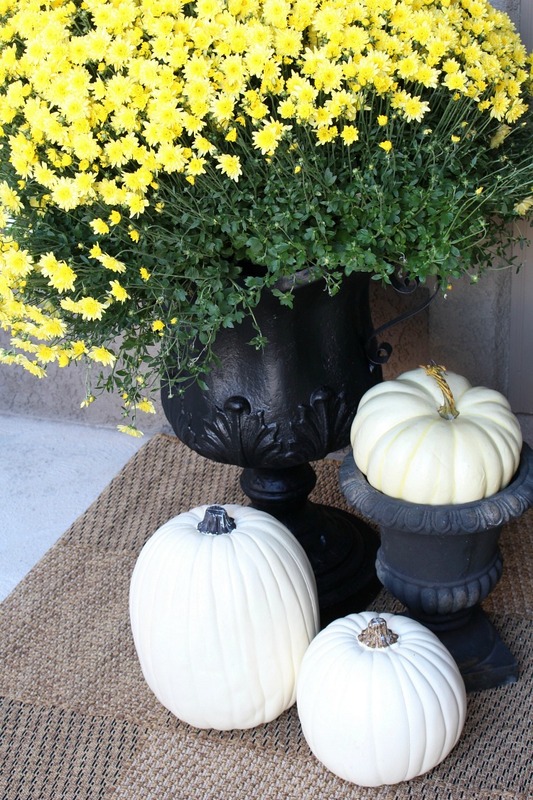 These white pumpkins are standing in for the temporary “welcome,” but how about those mums?? 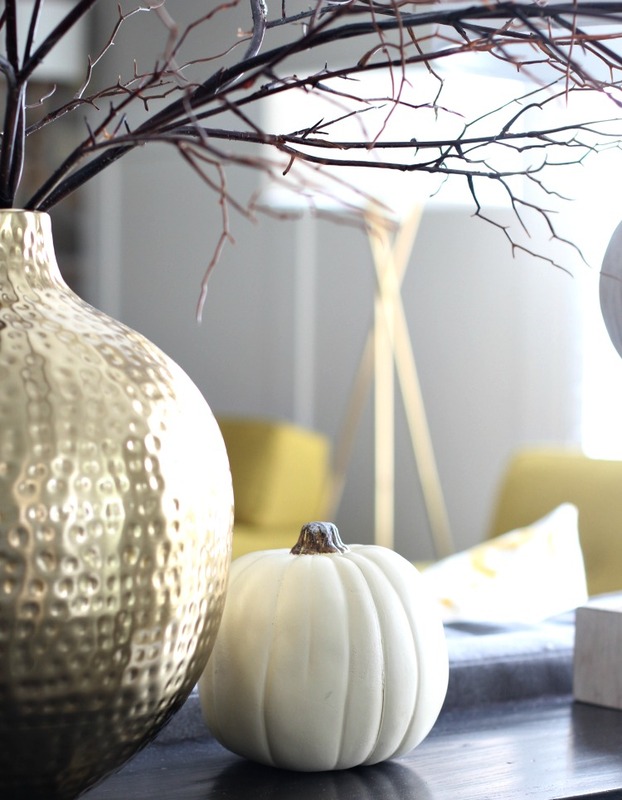 Last week, I had the honor of participating in the Homegoods fall home tour. My first of four fall home tours I’ll be in this month. You can see our kitchen and newly renovated loft decorated for fall in that tour HERE. 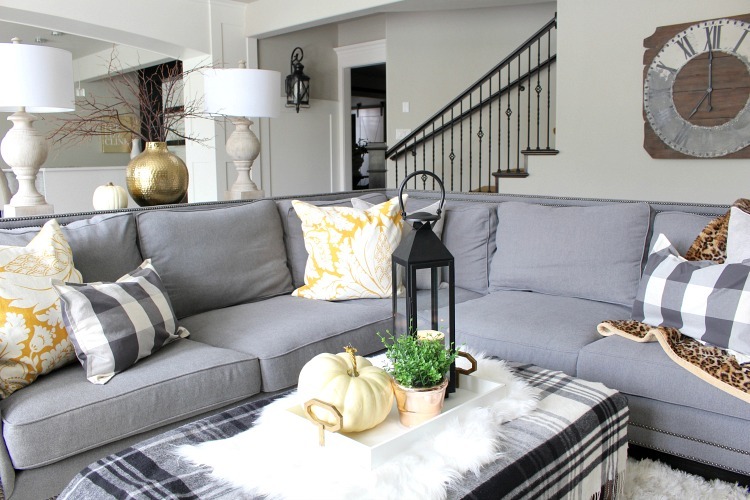 Our family room in our basement also got a little fall makeover. I only had to do a few things to make this room fall-cozy. First, I dug out my favorite fall blankets and throws. If we aren’t watching a movie or football in our loft, then you’ll find us here. I kept my yellow summer print pillows out since they have the fall colors I love. 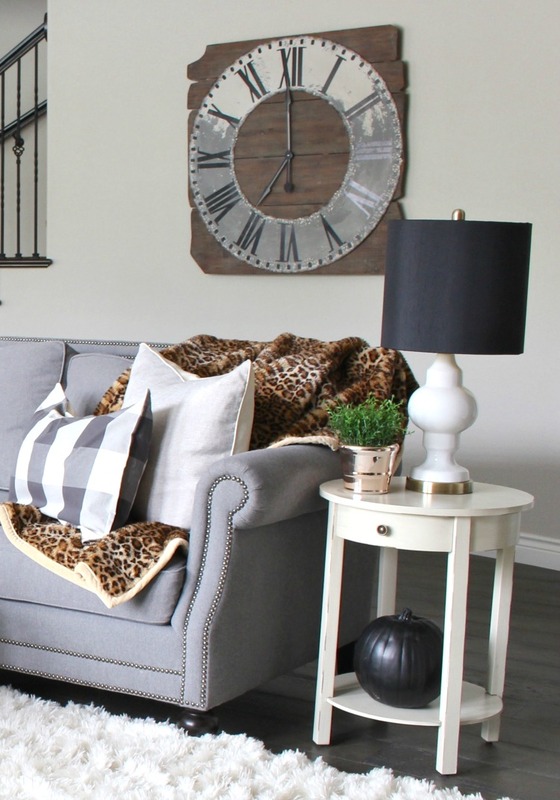 My buffalo check pillow covers are a favorite of mine that I’ll use through Christmas. I love twiggy things. Our trees will look like this very soon once they drop their beautiful autumn leaves. Snip some branches from your own tree or take a fall stroll and find a dead tree to gather from. 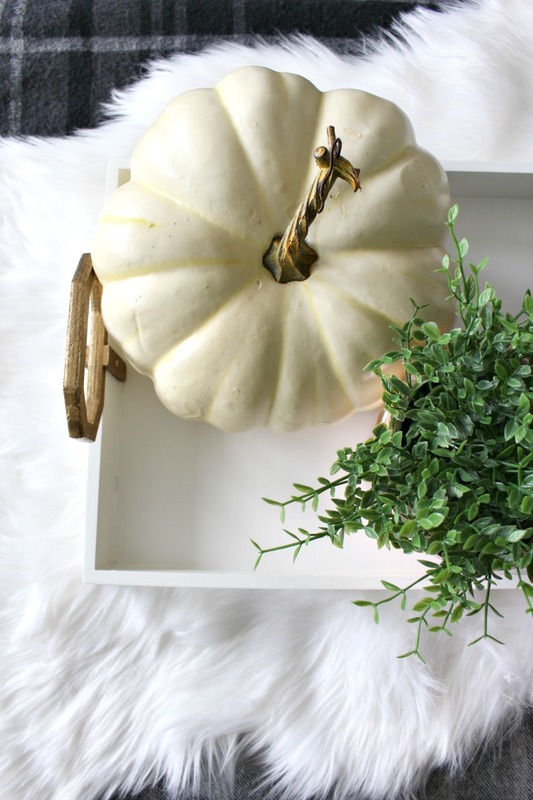 Fall decorating can be as simple as scattering a few mini pumpkins around. 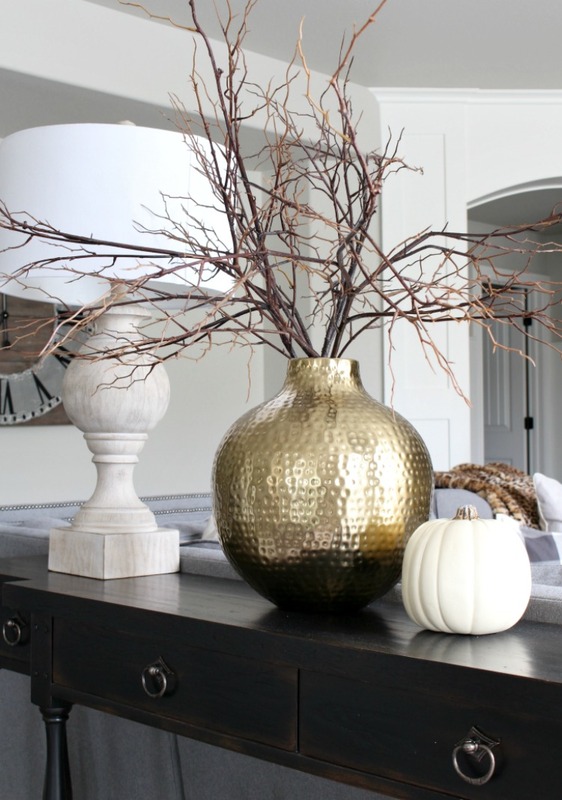 I’m loving the look of copper in fall decor this year. In an ideal setting I’d love to have little succulents or rosemary plants but I’m tired of the real deal dying on me, maybe I should water them perhaps (I’m sure that does wonders! ), but I’m okay with a little faux here and there. 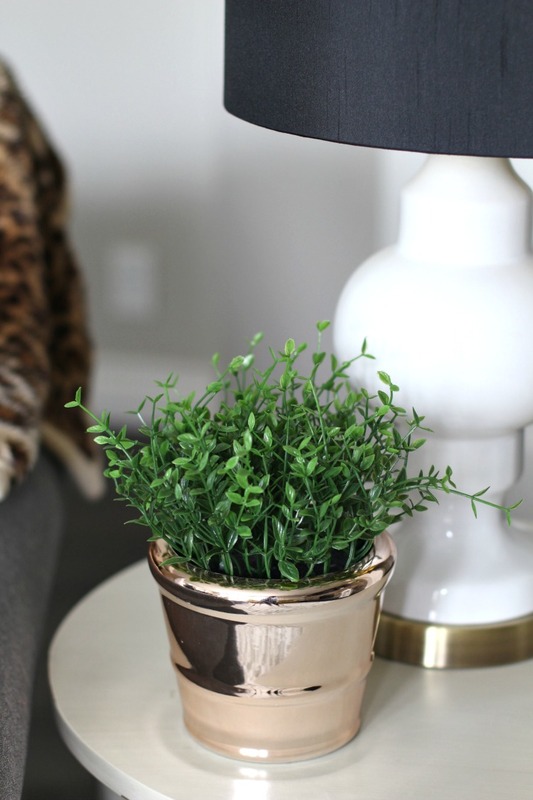 Especially in cute, shiny pots. Just behind the sofa and lamps you get a glimpse of our bar area. This is where our halloween bash will go down next month. Probably by the time you have seen this tour, I will have already dragged out the army of bins full of decorations for that event. Always a highlight of our year and I can’t wait to share more of that with you next month. I’d love for you to continue following along with all of my design adventures and you can do so by signing up for my weekly newsletter HERE. 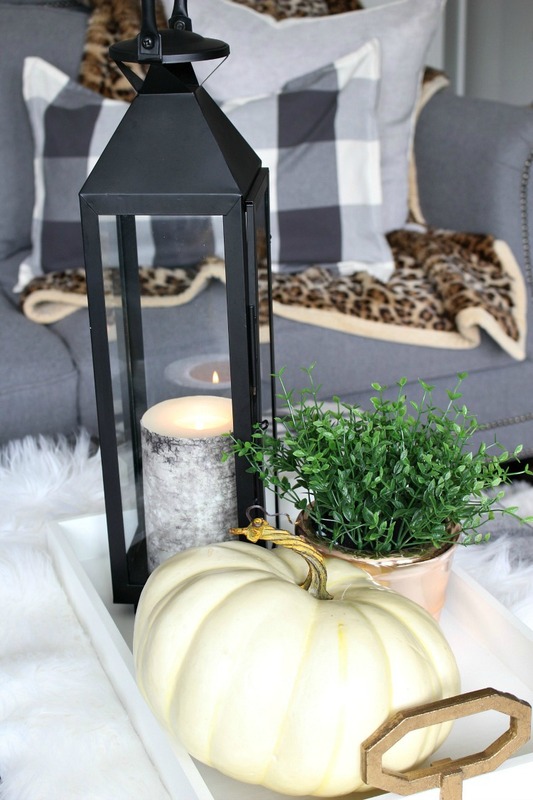 Thank you so much for stopping by today and catching a glimpse of some simple fall decorating in my home. 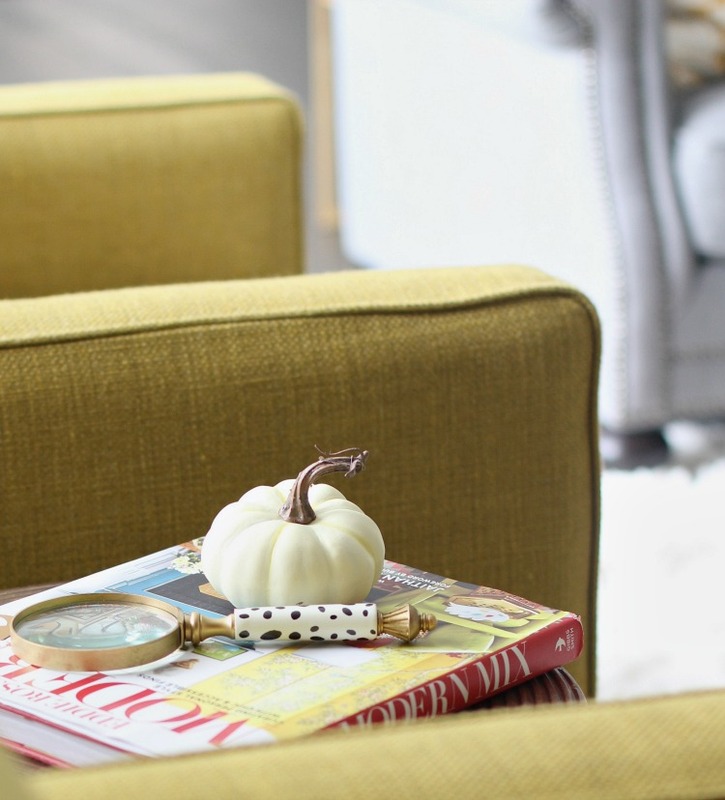 Tomorrow on the blog I will be participating in another fall home tour so I hope you stop back by to visit! 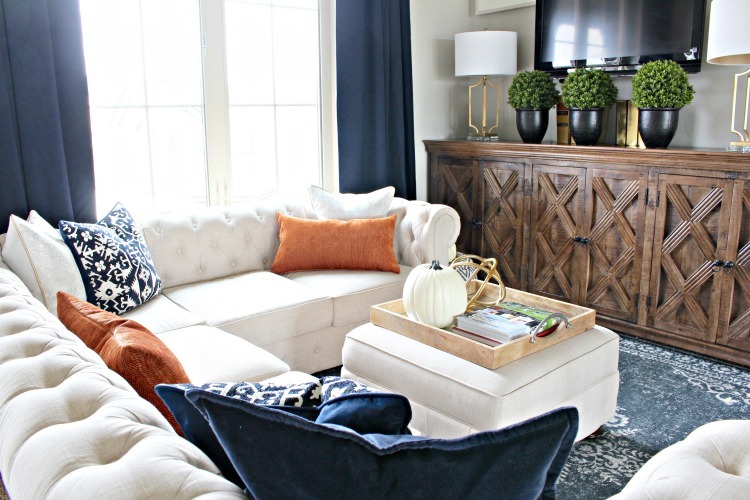 Just a sneak peek of our living room and what’ll be on that tour…Also, you can see my first fall home tour that I shared last week HERE. Next stop on the Harvest Haven Fall Tour is the lovely home of The Willow Farmhouse. You may want to refill your morning cup of coffee (I’m refilling mine!) and get cozy so you can keep touring all these fabulous homes. Your home is just beautiful! I had to laugh when you talked about trying to find pumpkins to decorate with. I thought I was the only one who thought that! We need our own greenhouse to grow them on our schedule. Thanks so much for sharing your home tour with me, loved it! Thank you Jen! You know I feel the same about you! Thank you Bree! I’ve had that throw for a couple of years now (most likely from Homegoods 😉 ) So fun being on this tour with you! 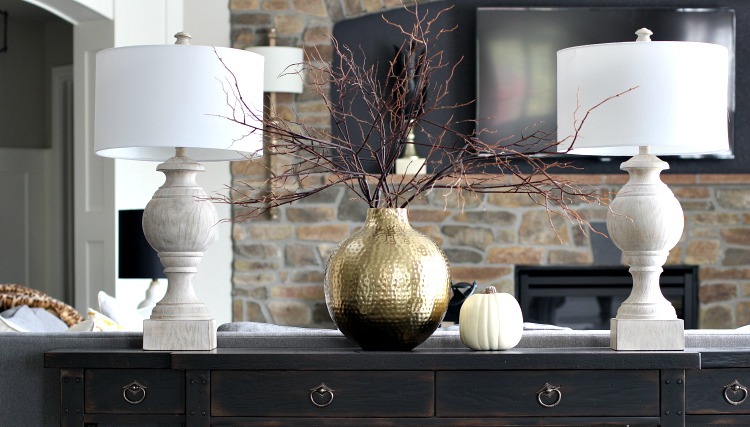 Shauna, I love all the gold and black touches.So pretty and warm! Beautiful! Thank you Kathleen! Looking forward to enjoying your tour today! Shauna thanks for sparing us from all your spooky decor 😉 I always enjoy reading your humorous commentary esp when it’s accompanied with pretty pictures! You no like spooky, Mysha?? lol! Thanks for stopping by and I’m looking forward to touring your home today! Thank you Oscar! I can’t wait to tour your home today! I know it will be fab as always is! 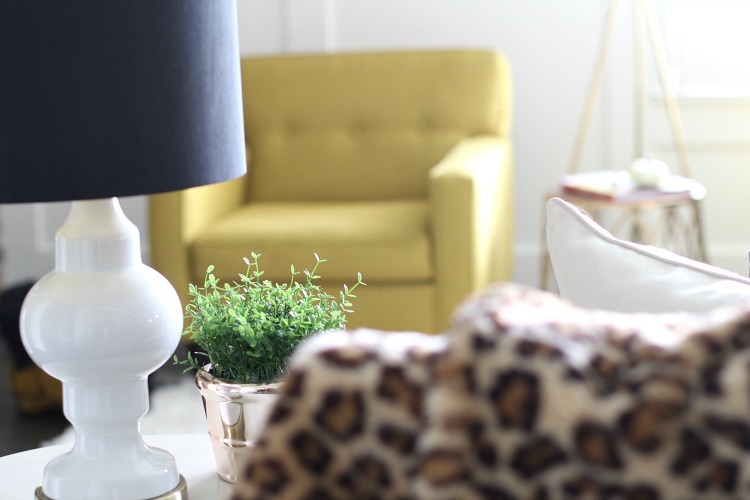 I love the shades of yellows that you’ve incorporated in your decor. Your home looks beautiful. Looking forward to more tours. Thank you! Thank you so much Erin! I’m exhausted…lol! Really could just chill on the sofa with a latte about now! The house smells so pumpkin-y and I love it. I think you need to pack up the family and come visit us in Colorado, escape the heat in Cali! 😉 Miss you so much sweet friend! Shauna, just divine!! 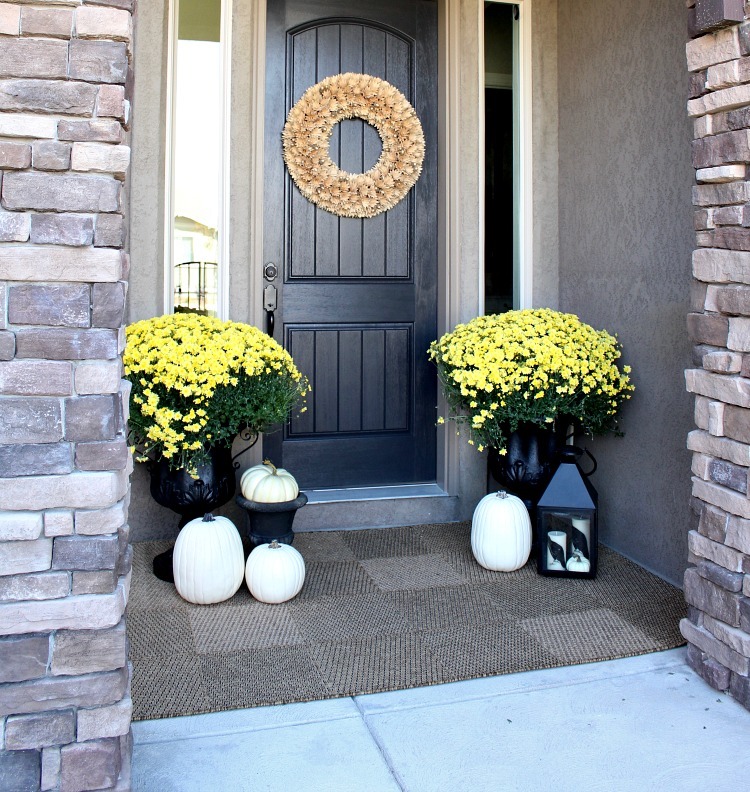 I love those gorgeous mums at the door, and the yellow touches throughout! 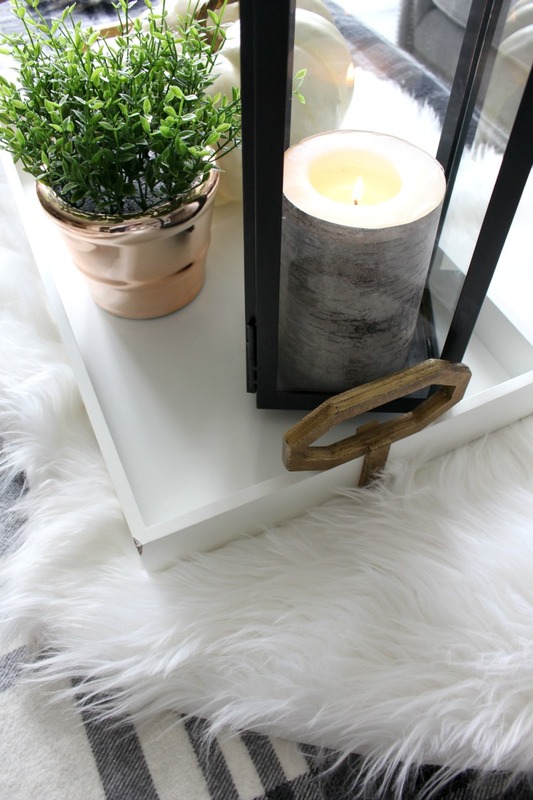 The cozy throws and the touches of copper! 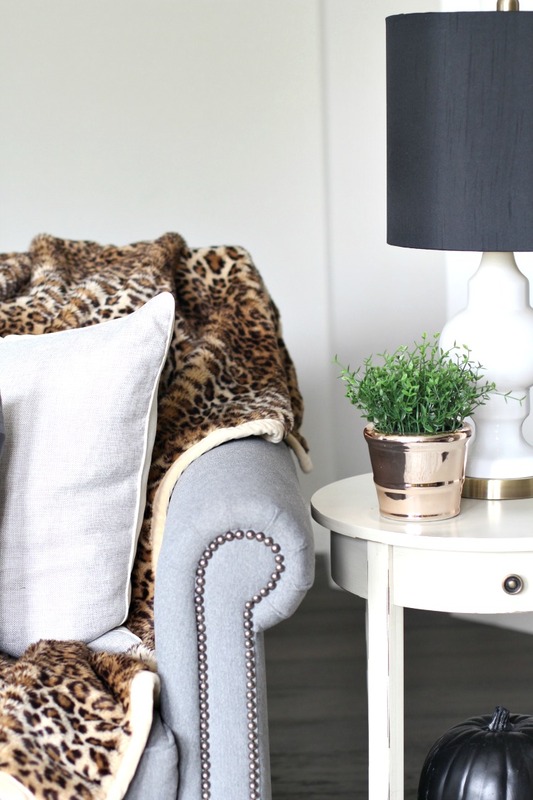 Also, that gray chaise with that velvet pillow!! Lovely!! Thank you Amy! I can’t wait to tour your home next! I know it’s gonna be so fabulous! Thank you Amie! I’m heading to your tour today and can’t wait to see it! You should come to our halloween bash! It’s always a blast! Summer, thank you so much for inviting me on this tour! I just adore you and feel honored to be a part of this amazing tour! I’m off to see your new home and can’t wait to see all your fall touches! 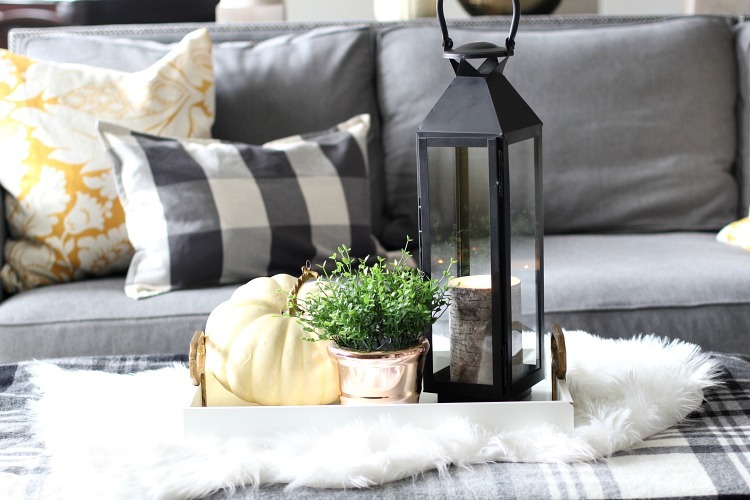 Love your Fall Home! 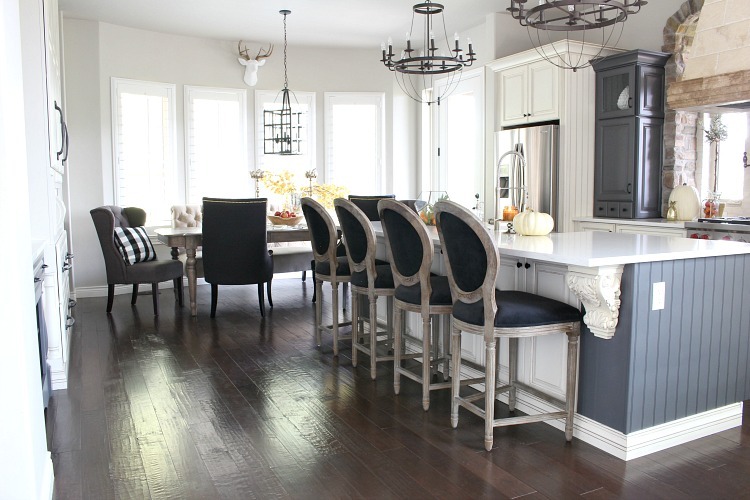 Your kitchen is gorgeous! 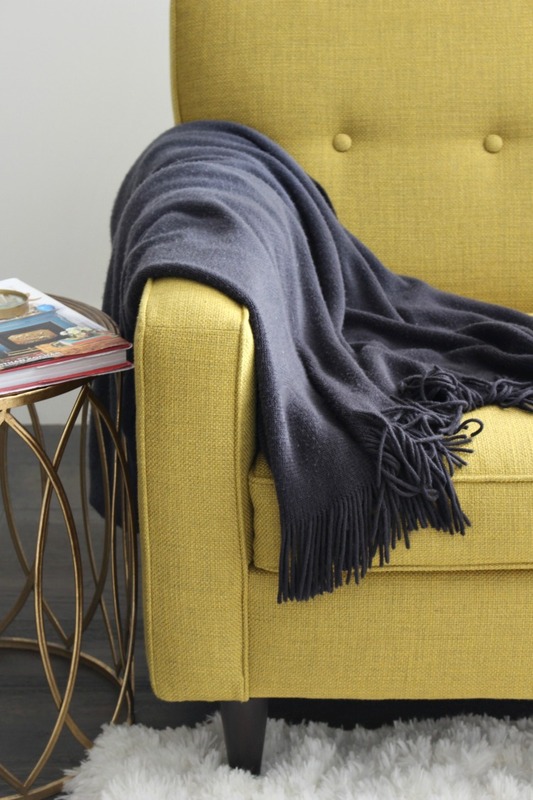 I especially love the gray with yellow color combination, and oh my your gray buffalo check pillow is wonderful! Great Fall Tour! Can’t wait to see your Halloween decor! Thank you Gloribell! Happy fall to you! 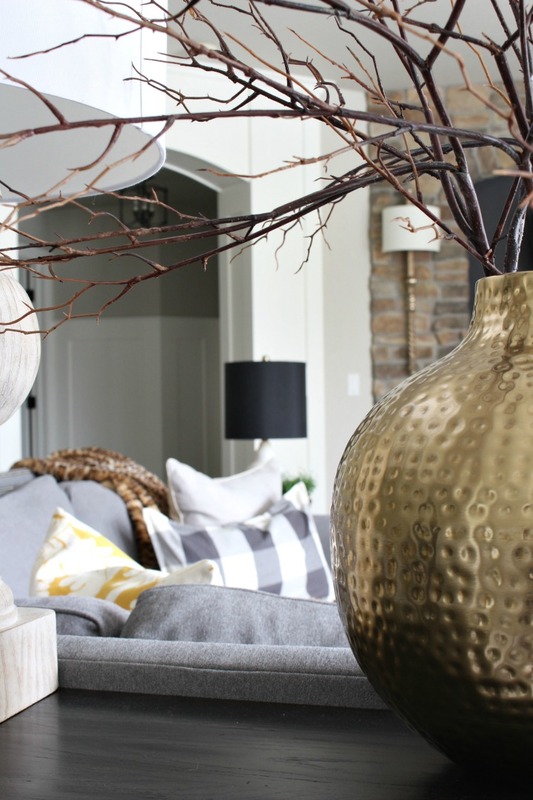 Just found your blog through the Design Mom house tour. I’m in Colorado Springs (Old North End) also. Have you been to Spencer’s for pumpkins? They always have a great selection… I just don’t know if they had them a month ago! I’m headed down there tomorrow to get some for my front porch. Hi Kristen! I haven’t tried Spencers yet, thank you for that tip! Have fun shopping for your pumpkins, happy fall!